The weight bench Kettler Alpha Pro is an excellent basis for your weight training. It is stable and safe with its very large feet. The sturdy frame can be loaded up to 300 kg, for intensive bench press exercises. The Kettler weight bench Alpha Pro offers a varied training. Seat and backrest are multiple adjustable in incline - for more exercises and high comfort. Even negative bench press is possible with the multi-functional bench. Additional components enrich the exercise variety: the training bench can be equiped with curlpult and leg curl and is a powerful team together with the barbell rack Vector. Die Hantelbank alpha pro: Seit kurzem benutze ich diese und bin sehr zufrieden. Die Verarbeitung ist hochwertig und der Beincurler ist eine gute Ergänzung.Ich würde diese Hantelbank sofort wieder kaufen. Robusta, pratica, semplice da montare e bella esteticamente. Il prodotto giusto per chi cerca il professional nell'home fitness. Rapporto qualità prezzo ottimo. 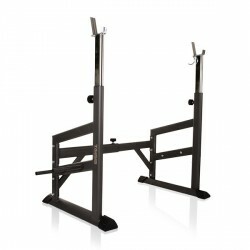 Taurus barbell rack Pro In stock! Kettler curlpult Delta XL/Classic/Primus/Alpha Pro In stock!